SAMTEC 's new high speed cable assembly systems provide flexible high speed I/O solutions on 0.5mm (0.0197") and 0.8mm (0.0315") pitch (HQCD & EQCD Series), JTAG interfaces (HHSC Series), edge card interfaces (EEDP Series) and custom cable assemblies to meet any signal integrity specifications. These assemblies are manufactured with 38 AWG low dielectric constant (k=2.1) miniature coax cable. They are ideal for longer cable lengths up to one metre, high flexing, up to 40,000 cycles, and with small bend radii down to 2.5mm or less. The high speed cable assemblies offer low skew and superior EMI performance in single-ended and differential pair signal applications. Solder joints are fully encapsulated for added reliability, and a variety of standard locking and latching options are available for applications requiring durable interfaces. Other assemblies are manufactured with 30 AWG twin-ax cable optimised for 100? differential pair applications. 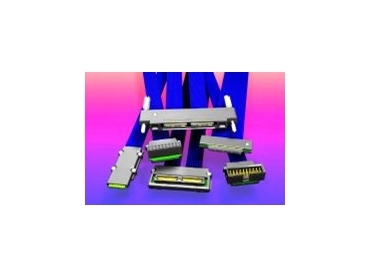 Most standard Samtec Connectors can be terminated to these cables, as well as Samtec flex circuits, to achieve a variety of cost-effective solutions for high speed, high reliability data links or test links and more complex high speed I/O applications.